Realising that you don’t know half as much as you thought you did about something that you love is, let’s be honest, a humbling experience. An experience that, thanks to the dramatic adaptations of the Doctor’s New Virgin Adventures, I’ve become all too familiar with. 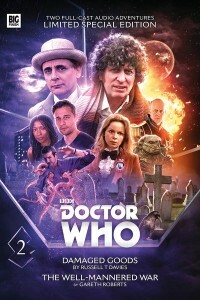 I mean, I didn’t even know that Russell T. Davies had written any Who related novels prior to Who’s mainstream re-launch in 2005, and as I’ve previously said, I wasn’t aware of Gareth Roberts’ books (something I was quick to redress following my initial exposure to his work), which has resulted in me eating a lot of humble pie. And when I say a lot, I mean platefuls of it in every flavour you can imagine, and a few you’ve probably forgotten, but the one I gorged myself on was abject humiliation with a side order of embarrassment, dripping in ignominy with extra indignity and shame. Having prostrated myself at the altar of fandom, I returned to the fold, determined to right my wrongs and spend a day or two familiarising myself with the stories in question in an effort to discover just why they’re so beloved (and they are you know, as anyone who is familiar with both novels will happily tell you, probably in the much the same fashion as they told me) by everyone who has had the good fortune to read them. Almost immediately, it’s glaringly obvious why Damaged Goods is a firm fan favourite, as it zips along at an incredible clip, crackling with energy and bursting with ideas; and even though it features two companions who I’m totally unfamiliar with (Chris Cwej and Roz Forrester), I sound found myself dragged into the plot with a huge grin on my face, and along for the ride. 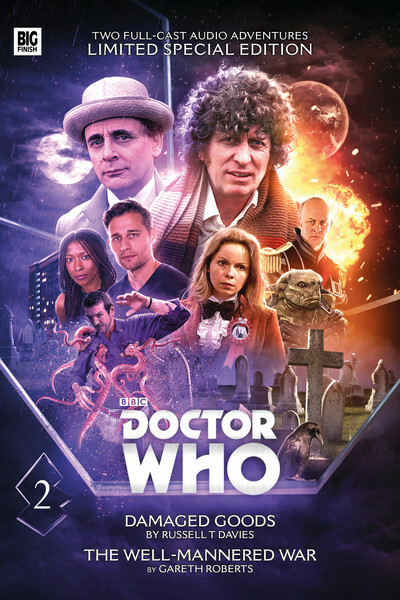 Superb characterisation melds seamlessly with a razor sharp plot featuring other-wordly Class A Narcotics, psychic twins, Timelord Weapons of Mass destruction, a web of interconnected, wonderfully realised relationships and wholesale death and mayhem. All of which sprang from the mind of the man who brought The Doctor back to the Saturday night schedule. It’s brought to life by an incredible cast who power their way through the tale adapted by John Dorney. Talking of adaptations, Jonathan Morris’ masterful adaptation of Gareth Roberts (which I read in the run-up to listening to the drama) The Well-Mannered War is also fuelled by a magnificent cast, and while it doesn’t gallop along at anywhere near the pace of its partner in crime, it’s an intelligent, funny, sharp examination of the futility, and ridiculous nature, of war and genocide that just happens to be set at the end of the Universe. It also questions the reasoning behind conflicts that are too often shaped by hidden adversaries with a shadowy agenda of their own and finds the Doctor, Romana and K-9 (who becomes entangled in the dark mire of political office) caught between humans and Chelonians and the “battle” for Barclow in which no casualties have been recorded or ordnance spent. Until of course, the Tardis arrives and all hell (relatively) breaks loose, as both sides find themselves being manipulated by unseen forces playing a very, very long game. *Limited edition collection. Both ‘The Well Mannered War’ and ‘Damaged Goods’ are also available as separate releases.